Home for the Homeless, is a 2008 Dueck film production, which explains the lives of Mennonites who escaped Russia and fled to Paraguay. The timeline of this is from the 1930’s to 1980. The story is narrated in English while actors in some scenes speak in German. For those who only speak English, some of the conversations held between characters cannot be understood, as some is left without translation. From beginning to end, the viewer is given a glimpse of what life might have been like for these people throughout their settlement and growth in Gran Chaco. Significant moments in history are highlighted in a way that is educational. For those interested in Mennonite history, this film acts as a helpful contribution. A variety of scenes carry out well illustrated information such as travelling, types of transportation, refugee camps, and different types of work including taming wild cattle and milking. For additional understanding, maps are shown to describe parts of the story, along with old film footage and photos. 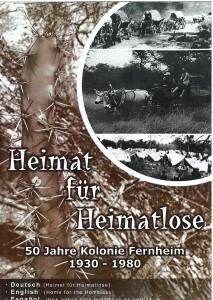 There is a discussion of how the Mennonites arrived at their assigned location with an explanation of conditions and hazards of their newly inhabited land at the time. There is also some brief background history regarding the Russian Mennonites in order to explain their experiences prior to, and following, the Bolshevik war. For a time, the Mennonites shared their homeland with another group of people called the Lengua tribe. The ways in which these differing cultures co-existed is addressed in detail, along with the Mennonite’s struggles and successes in the area, as they made way for 2nd and 3rd generations. Agriculture, farming and factory processes are explained. Schools, churches and hospitals are spoken about being that teaching, health care and employment are/were a large part of the community’s activity. Much of the film’s information is easily understandable, moving at a slow but steady pace. The film can be watched as a family; however it is advised to be aware that there are some scenes that may be uncomfortable, such as bombing, a vaccine injection in an arm, and wounds being un-bandaged. Nothing graphic is shown in these. Home for the Homeless (Paraguay). Dueck Film Production. 2008.